I admit that I am not as big of a Harry Potter fan as my wife and son. I like it fine and love going to Universal Studios here in Florida to get totally immersed in it but I have only read the first book (way back when it came out) and don't always sit for all the movies when Mindy and Joe have their marathons. I do take some small credit that I introduced them to it tho! 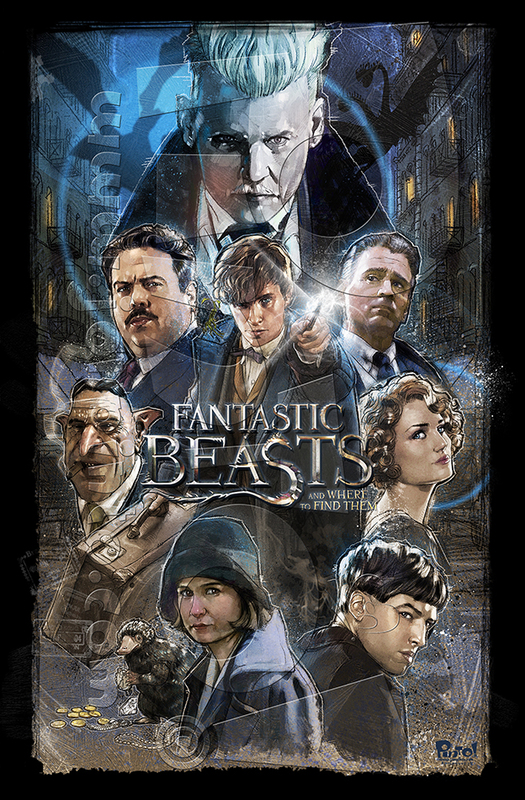 So when Fantastic Beasts and Where to Find Them came out, I was excited but not pulling my hair out in anticipation. I was quite surprised how much I really enjoyed the movie! And it was me that suggested that we go back and see it a second time as well. Granted I had to ask some questions about how this all works together in the wizarding world that Rowling created but I love the fact that my family can answer all of them! You know, I think I actually like this movie the most of all the "Harry Potter-verse" films. If you have not seen the movie, then my apologies that my picture contains a spoiler. And here is the original thumbnail from my sketchbook! Kept it pretty close! !